MPSC Clerk Typist Recruitment 2018: Every year, Public Service Commission publishes various Recruitment Notification for the appoint of well-skilled candidates for various vacant seats. Now PSC is going to conducting the Maharashtra Public Service Commission Exam for 392 Clerk Typist post on 14th October 2018. 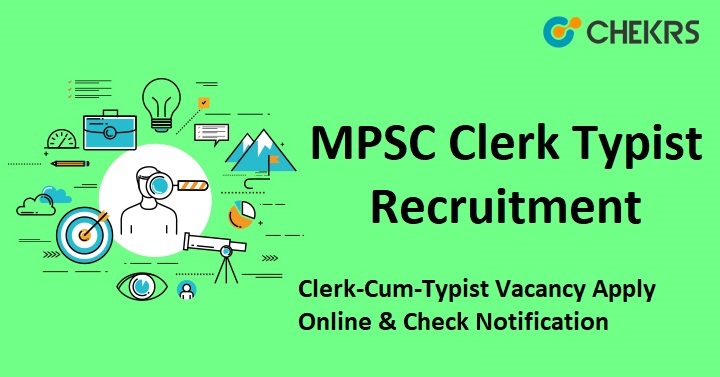 Interested candidates can apply for the MPSC Clerk Typist Recruitment 2018 Application Form on or before the closing date which is 11th September 2018 via online mode. Candidates, who are interested in Public Service Commission Jobs, can apply for MPSC Clerk Typist Vacancy 2018 and get all details such eligibility condition, application process, age limit and more information through this article which are in the given below section. First of all, candidates need to visit the official website of MPSC i.e. www.mpsc.gov.in. Now click on MPSC Official Notification 2018 link. Read this Notification carefully and get all instruction related to MPSC Application Process. On the website, page top ends a given “Online Application” option and Select this link. Application Portal will be open. New candidates can complete registration id. Now enter the registration number, password and click on “Log In” button. The Application form will be open. Now Fill up all the information regarding qualification and Attached documents. Check Application Form carefully and submit it. Application Fee will be deposited through online banking. Remarks: The Candidate wants to know about recruitment information, we can update soon about MPSC Clerk Typist Recruitment 2018 on our website that is www.jobs.chekrs.com. If you have any query about MPSC Jobs that you can write comments on commenting box and take a review or feedback.